Steven Savile has been an international sensation, selling over half a million copies of his novels worldwide and writing for cult favourite television shows including Doctor Who, Torchwood, and Stargate. Now, he is finally making his US debut with Glass Town, a brilliantly composed novel revolving around the magic and mystery lurking in London. In 1926, two brothers both loved Eleanor Raines, a promising young actress from the East End of London. But, along with Seth Lockwood, she disappeared, never to be seen again. Isaiah, Seth's younger brother, refused to accept that she was just gone. It has been seventy years since and the brothers are long dead. But now their dark, twisted secret threatens to tear the city apart. Seth made a bargain with Damiola, an illusionist, to make a life size version of his most famous trick and hide away part of London to act as a prison out of sync with our time, where one year passes as one hundred. That illusion is Glass Town. And now its walls are failing. Reminiscent of Clive Barker's Weaveworld and Neil Gaiman's American Gods, Savile brings out the magic in the everyday. 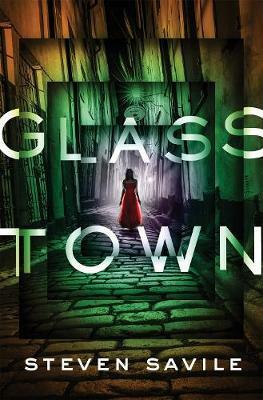 Glass Town is full of gritty urban landscapes, realistic characters, conflict, secrets, betrayals, magic, and mystery. STEVEN SAVILE has written for popular franchises including Doctor Who, Torchwood, Stargate, and Sherlock Holmes. He was a finalist in the People's Book Prize in the UK and has won the Lifeboat Foundation's Lifeboat to the Stars Award and the International Association of Media Tie-In Writers Scribe Award. He wrote the storyline for the bestselling computer game Battlefield 3, and his novel Silver was one of the top thirty best-selling novels of 2011 in the UK.